Telegram to Martha Berry from H. F. Carey informing her that he would like to fix fair for her to Cincinnati but that he cannot do this. 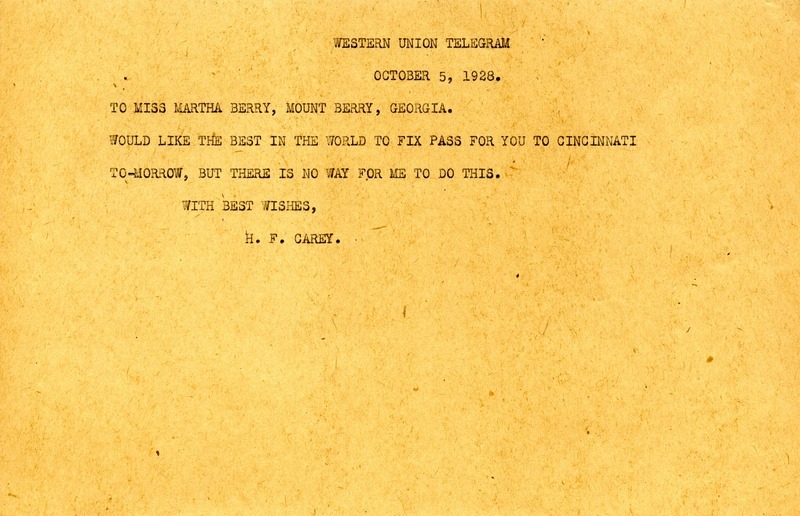 H. F. Carey, “Telegram to Martha Berry from H. F. Carey.” Martha Berry Digital Archive. Eds. Schlitz, Stephanie A., Haley Fortune , et al. Mount Berry: Berry College, 2012. accessed April 21, 2019, https://mbda.berry.edu/items/show/6875.